I have learned so much from being in growing friendships over the course of my nearly sixty-five years. My relationships with others are so important to me that I cannot imagine a lonely journey without my true friends sharing my life’s joys. My friends include a growing number of Millennials (sometimes called the Echo Boomers for the size of this generation, a generation which ranges from birth in the early 1980s to 2004), Generation X (ranging from the early 1960s to the early 1980s), Baby Boomers (my own post-WW II generation, ranging from 1945 to 1964 ) and a few dear (older) friends from what has been called the Silent Generation (1924 until 1945). Most of my G.I. Generation friends (the generation from 1901-1924, like my parents, are now in the presence of Jesus). These friendships transcend wealth, class, gender, race and ethnicity. They push me to think and learn. They tease and encourage me. They are around me like an army of love. Sadly, I know some who were friends but we are no longer close. This is true, so far as I can tell, with every person I know. Lives change, journeys are altered, people move away, things happen. 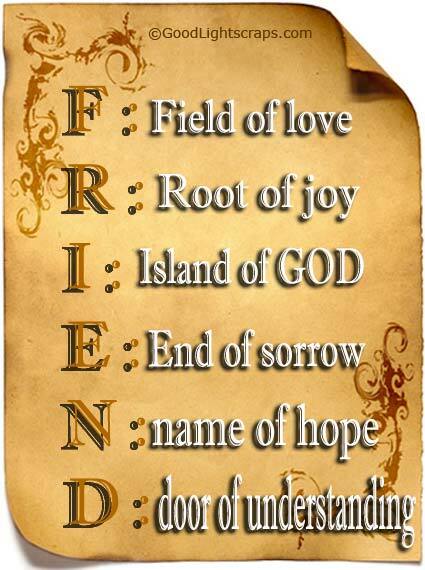 In most cases these things do not transcend friendship. A goodly number of my longest, and dearest, friendships are with people who do not live in my area. The telephone, emails and Facebook are all a great blessing for the continuation of these deeply valued relationships, as is an occasional visit that leads to a cherished face-to-face meal time. Nothing more deeply influences the choices I make, and the places I now go, than my friendships. The famous spiritual writer John Cassian said, “There is one kind of love between persons that is indissoluble, because the unity is based neither on esteem nor the greatness of one’s position or favors, not on a human business obligation, nor on natural need, but only on likeness with respect to virtue.” The ultimate virtue is love and true love always leads to deep and growing friendships. What is the sign of a friend? That tells you secret sorrows? No, that he tells you secret joys. Many will confide to you their secret sorrows, but the last mark of intimacy is to confide secret joys (My Utmost for His Highest, 787). To the end of sharing my life with more friends in the year ahead I have laid out a plan to meet with people face-to-face and thereby to introduce my friends to one another in the process. I have found that groups of four to six are about right for these meal visits. I spend so much time in relationships that I realized near the end of 2013 that I should order my relationships better so that I can write my forthcoming book on love and still grow my friendships rooted in the love which that I am writing about during this year. So I took an action step a few weeks ago. A series of small group lunches have been scheduled for 2014. I routinely meet with Christian leaders, both clergy and non-clergy. In order to facilitate my deeply relational mission, and to economize my time and increase my input into the lives of more leaders, I will convene some group lunch gatherings throughout 2014. Each lunch meeting will have one group question to “prime the pump” for a Socratic dialogue. Following this first dialogue we will be on our own to see what interests you and where we go in relationship. Through this engaging conversational method I believe that we can build deeper bonds of friendship with other people and better learn how to love one another through sharing questions and insights, thus “building one another up in the love of Christ.” We will also pray for one another. The hope is that life-changing friendships will develop over food and drink. Each of these lunch meetings will include a maximum of five persons who sign up to join me for the lunch. (A table of six in the back of the restaurant makes for a perfect context.) The meal will paid for a la carte by each of us personally. Each meeting will gather from 12 noon until 2:00 p.m. The location is: Genghis Grill, 106 N. Hale Street, Wheaton 60187. (630-653-3600). You can park behind Genghis Grill in the municipal garage for free if street parking is filled up before lunch. Parking is free for three hours. In order to join one of these engaging lunch dialogues all you have to do is register online. If, for any reason, you cannot attend then please email me so that I can try to fill your spot in the group. Even a last minute phone call can open up a spot for someone else who wants to attend. Go to www.act3network.com to register. Several dates are offered there each month. The first such lunch is on January 17. I hope those of you who live in Chicago will join me. if you do not live in Chicago, and I can come to your area, then we can arrange such a social gathering in your city too. You might want to set up a Unity Factor Forum with me facilitating a group and then we can also arrange one or more of these wonderful small group meals in your city. Finally, these planned meetings do not mean that I will not do other (private) meetings, just that I have stepped up my commitment to being a friend to as many people as God brings into my life for the purpose of growing relationships rooted in his joy and peace. Dave Lescalleet liked this on Facebook. James H Kim liked this on Facebook. John, I believe your reference to Oswald Sanders should have been to Oswald Chambers :-). I will change it. Thanks. I did change it this evening. Thanks Ray. This is fantastic. Thanks, John. I am doing a series on the Sermon on the Mount and focused on Relationships in the coming weeks, so I am looking forward to these blogs.